The depth of the sky in Abu Dhabi almost blue without any cloud during nearly all the year could be enhanced by the created cloud-like forms, producing for us electrical energy instead of the rain water. This energy based on natural resources (sun and wind) is as necessary for our every day life as the rain water is. The skin can be described as an area element separating the inside from the outside. Due to the large spans of the skin and due to the fact that the skin is not designed as a “perfect” shell it will require a significant amount of material to support it. It is therefore suggested to continue the columns supporting the skin base and the platform to the skin roof to reduce the spans within the skin. It is also suggested not to use the rather heavy steel structure but a timber structure where is possible to reduce the weight of the building. Additionally this would also reduce the carbon footprint of the building. The platforms are typically supported by the columns. The span of the platforms between two columns should be limited to a maximum of 12m. It is suggested to construct the platforms as a composite structure. The columns support the skin as well as the platform. To reduce the additional thrust force produced by the inclination of the columns it is suggested to arrange the columns in a way such that the thrust forces cancel each other out. Components: external skin will be created by a textile made of optic fiber PV mesh, composed of 3 layers: the optic fiber core, covered by a single walled carbon nanotubes, protected by the external layer of optic fiber material. On the dominant winds north-western side, the external elevation fabric will be equipped with the micro wind turbine-dynamos for to enhance the electric power production and bring the necessary refreshing natural ventilation. The south-eastern side of the external skin composed partially by the solar protecting PV shells and north-western side, will be equipped with the memory metal made springs, which will regulate their open-closed position, depending on external temperature. This device will regulate the natural cooling and ventilation system without the need of external energy. These shells will be made of self cleaning translucent material. 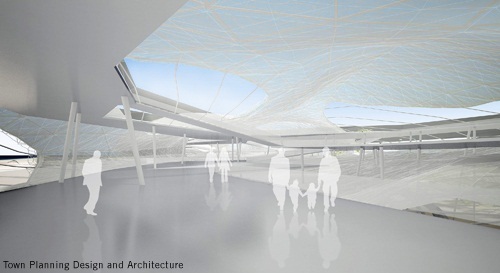 Internal breathing textile envelop will serve as a sand protecting skin, forming inner spaces. Integrated external skin is equipped with illumination led system. The ambient environment of the UAE creates extremes within which comfort conditioning needs to be made, and this will require a large amount of energy. 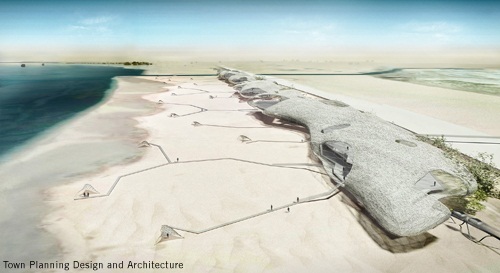 In the current age where fossil fuel stocks are quickly disappearing, it is imperative that being energy lean, sustainable and generating onsite energy is a first-consideration for the “Sand Dune Clouds”. Placing vegetation between the road and “Clouds” will allow for oxygenation of the road side air before prevailing winds carry the air through the installation. This will provide a fresh feeling to the space and can provide a natural air filter, thereby extending the lifetime of the internal fabric filters. Irrigation of this green filter will be via wind- and PV-driven pumps. It is proposed that natural ventilation and its associated passive cooling will be designed into the structure with appropriately positioned and sized openings. With the openings activating in tune with the ambient conditions (see Memory Metals section), this massively reduces the energy consumption for driving fans and actuators. The solar gains can be used to create a lateral buoyancy effect that will cause hot air to expel from one side of the building thus driving cooler air into the building through the opposite side. However, where there is a need for mechanical fans – and other electrical devices and lighting – the electricity to drive these fans will be generated from various natural and passive sources, including: CPV-optic fiber skin, wind-turbines, human energy through piezoelectric platforms and ticket gates. With the high-rate of commuters, there may be excess electricity generated that will then be stored in the ultra capacitor devices through the use of a one-atom thick structure called “graphene” as a new carbon-based material. These batteries are located under the walking platforms level. High-performance façade systems are proposed throughout the “Cloud”, manufactured to reduce direct solar heat gains yet provide sufficient daylight into the interior spaces. With bright clear Abu Dhabi skies, it is possible to utilize fairly dark tinted systems and still provide balance in comfort and visibility. In times of extreme hot weather, a reserve-cycle heat pump system is proposed that could use the adjacent waters as a heat-sink. A water-based cooling system can be integrated into the structure for distribution. Condensate forming on the exterior surface can be collected and used as the heat transfer medium or used for irrigation of the green filter. The use of mechanical cooling can be reduced by introducing thermal mass into the structure. Whilst the general light-weight scheme does not such the use of concrete, the material can still be patchily located in prime areas of high heat gains. The energy from the cooler night-time air will be stored and then released during the day. Geothermical energy is the energy solution for the world. Clean, inexhaustable, 24/7 available.